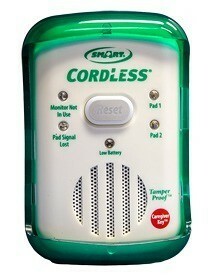 The “New Patented Technology” CordLess® Fall Monitor can be mounted away from the residents bed ( cordless bed alarm ). Monitor can also be placed above bed which reduces alarm noise near the residents head and TamperProofs the monitor so the resident can not reset it on their own. Monitor can also be placed in the hallway which reduces in room alarm noise. It is safer because caregivers are notified by a bright blinking light and a quieter alarm in the hallway which notifies them when a resident is getting up. This is our patented cutting edge technology fall prevention monitor with patented safety features that let a caregiver know if the signal is lost or the CordLess® fall monitor is out of range. It can also be mounted outside the patient room for a quieter solution! The TL-2100G CordLess® Fall Monitor continually indicates that a signal is being received from the sensor pad and the system is in good working order. If the sensor pad signal is broken or out of range, monitor alarms and indicates signal is lost. Use Quiet CordLess® fall monitor with bed sensor pad; wheelchair sensor pad; pressure sensing floor mat; fall mats or motion sensor. Works with CordLess® bed or chair sensor pads, CordLess® floor mats, and Infrared Motion Sensor PIR-01.